Our Play Director, Michael Bischof, designed an incredible early years’ outdoor learning environment for St Chrysostom’s Primary School in Manchester. The development focused on the school’s nursery, with a plan to enhance and promote the 7 areas of learning, outside of the classroom. The children now have a huge outdoor space to explore, conduct investigations, build climbing confidence, develop writing, practice art, connect with nature and learn about science. An engaging playground surface for safe, gross motor skills development and mathematical/literacy activities. To encourage physical activity and gross motor skill development, we created a roadway for the children ride to along with their miniature bikes and trikes. The roadway runs through the entire area and includes speed bumps and a huge ramp with a tunnel underneath. As children use the ramp, they will begin to learn about resistance and gravity. This is also a great way to teach children about road safety and encourage turn taking and sharing. We included numbered parking bays and an A-Z caterpillar to encourage numeracy and literacy. The main playground is now an attractive blend of different textured, soft surfaces which are a combination of earth colours and natural looking artificial grass. 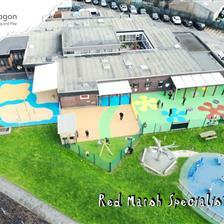 You can view our fantastic range of playground surfacing here. We transformed a once underused corner of the playground, to encourage quiet reading, mark-making and children's interaction with nature. Our Gazebo is the focal point of the area, with enough seating for 30+ children. We installed mark-making boards, moveable artificial grass topped seats and a Story Telling Chair within the Gazebo to enhance story time and outdoor lessons. We then placed a corner planter next to the Gazebo for the children to grow their own flowers and learn about the plant life cycle. The children will arrive at nursery enthusiastic, as they look forward to seeing how their plants have progressed. 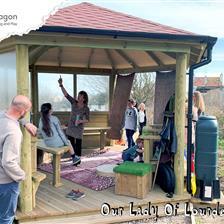 You can view our range of Outdoor Classrooms here. We mounted a bright and colourful target panel onto a timber wall, to create a space for active ball play. The target panel includes a goal, stumps and numbered targets. Children can take turns to aim at the target or wickets, further developing reaction time and alertness. This area will also encourage social interaction, friendly competition and help the children learn how to respect each other. For active play, we installed our Tintagel Play Tower, designed to improve: grip, grasp, upper body strength, balance and gross motor skills. With the roadway passing underneath the Tower, children will learn about positioning of up, under and over. Take a closer look at our active playground equipment here. Our Playhouse and Role Play Panel will inspire imaginative play and provide the children with numerous role and pretend play opportunities. Being an open-ended resource, the Playhouse can be transformed into anything from a Bakery, to an A&E department. As children play in their specific roles, they will naturally develop their understanding of the world around them. We also created a stage area to encourage musical and artistic performances. The stage includes den posts for fun den-making activities. You can view our fantastic range of imaginative play equipment here. Bug Hotel – this will attract mini beasts and become their new home. Bird Box and Feeding Table – to attract birds for observation. Mud/Sand Quarry – this is a sand box connected to a rope and pulley. Children can create their own quarry and transfer sand or mud from the natural zone, across to the investigative learning space. 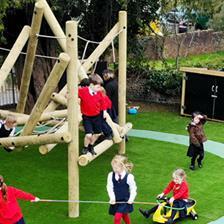 Take a closer look at our natural playground equipment here. Water Wall – children will be fascinated as they pump the water down the interchangeable gutters to the spinning water wheel and tipping ‘Shiodoshi. It’s a great way to introduce children to topics such as the water cycle, gravity and source to mouth. Damming Station – directly attached to the Water Wall, children will work in team to build dams and stop the flow of water. Scales – children can balance materials in the scales and be introduced to mathematical concepts. Tuff Spot Table – this is for mixing components and child-led games. Double-Sided Work Station – this can be used to gather materials, plan investigations and openly discuss findings. You can see all of these fantastic messy play products, on our Mud, Sand and Water play page. The mark making area is a quiet play space for artwork and mark making. To offer shade from the sun and other weather conditions, the entire area is covered with a shade sail on posts. We added two Easel Tables, to provide a seating arrangement for the children to draw and write, in a relaxed manner. It also provides a unique social setting for children to interact over their artistic creations. Next to the Easel Table, we installed a Giant Whiteboard and Poster Paint Panel. The giant, Poster Paint Panel, allows children to stand behind the transparent screen and 'trace' paint portraits. You can view our range of outdoor mark-making equipment here. It was fantastic to work with St Chrysostom’s Primary School, to enhance the outdoor provision for their Nursery playground. We hope the children vastly improve in their development and enjoy experimenting with the magnificent choice of playground equipment on display. Are you looking to revamp your early years outdoor learning environment? We cover all areas of England and Wales, simply fill out our Contact Form and we will be in touch to arrange a free consultation.